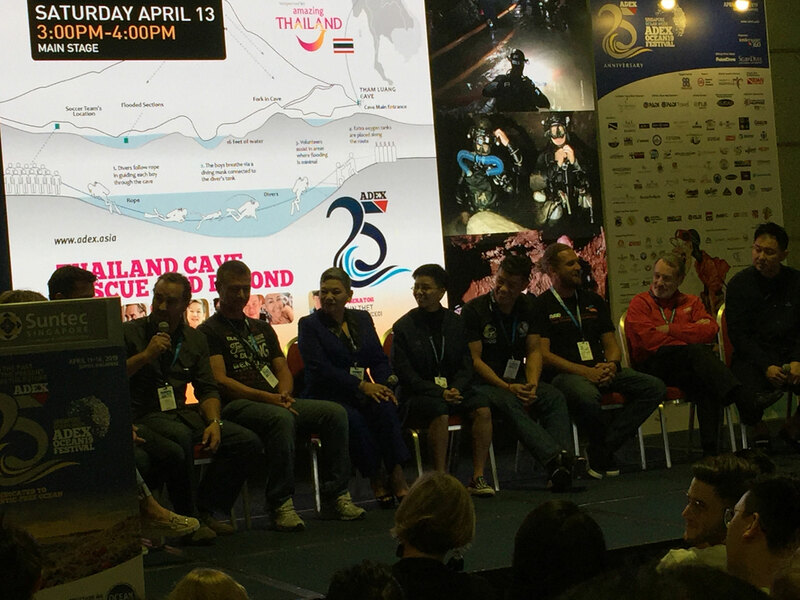 After a blistering April 12 that saw plenty of diving heavyweights grace the main stage of ADEX Singapore, April 13 of ADEX Singapore 2019 offered no let up as Ms Natalie Harms from UN Environment graced the ADEX Singapore 2019 main stage to moderate a Sustainable Diving Dialogue and panel discussion at 10am in the morning. Co- moderated by Ms Chloe Harvey from the Reef World Foundation (Green Fins), the panel consisted of Ms Rosie Cotton (Owner and General Manager of Tioman Dive Centre), Mik Jennings (Commercial Manager of Blue O Two / Worldwide Dive and Sail), Cassian Bellino, (Sustainability Management Trainee from Six Senses Hotels Resorts Spas), Adam Broadbent (CEO of Zublu), John Standing (Director of Fourth Element), Paul Tanner (Territory Director, PADI Asia Pacific) and John Thet (Publisher of Asian Geographic Magazines). Natalie started the panel by talking about how the UN was working with governments to improve ocean governance by starting regional marine programmes to reduce plastic pollution. With Tioman Dive Centre receiving the Green Fins awards, Rosie Cotton was congratulated by Chloe as Rosie told the audience how Greenfins had helped Tioman Dive Centre with a series of small changes that put them on their way towards sustainability. She was also grateful for the considered actions recommended by GreenFins which promoted change without disrupting businesses. She added that by transmitting the correct sustainability mindsets and behaviour to her staff, the staff were in turn able to pass on this wisdom to customers. Rosie also added that being consistent was key to effective change. With a footprint of 15 resorts all over the world, Mik Jennings shared his experience of obtaining sustainable products for all of Blue O Two’s resorts, which proved to be a headache as distributing products from a central source could often lead to a bigger carbon footprint as opposed to sourcing items were locally. 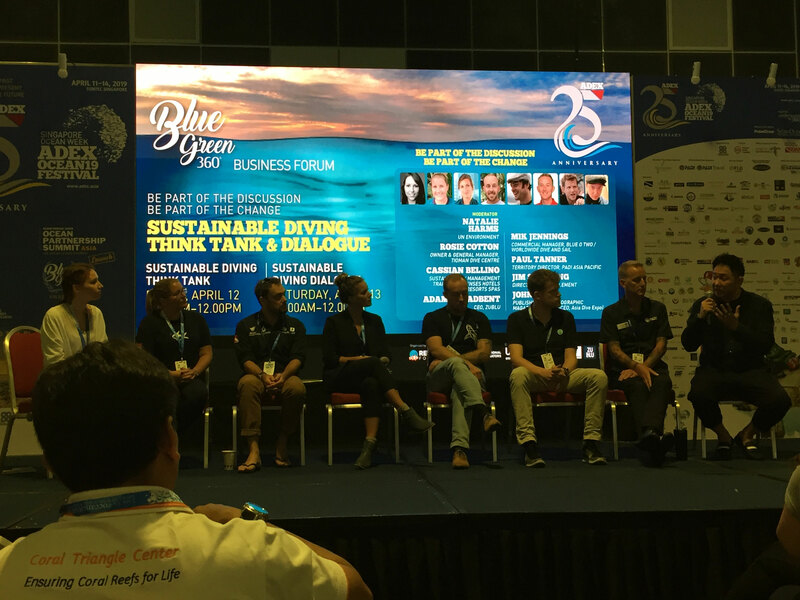 With audiences encouraged to join in the dialogue, Bruce Dudley, Senior Vice President of Globe Series, ADEX Singapore’s partner in the Ocean Partnership Summit in Singapore next year, posed a question to the panelists about whether any of the panelists had seen tangible rewards from being sustainable. Adam Broadbent from ZuBlue acknowledged that while their efforts might initially only be just a marketing benefit, Mik felt that while some were choosing their vacation according to the green credentials of the resort, many others continue to use price as a major yardstick for their vacation choice. One of the most valuable insights proffered by the panelists was provided by John Standing, who stated that Fourth Element’s willingness to sell gear made from sustainable products was something that everyone should pursue as customers would eventually be forced to buy only sustainable products once most manufacturers moved in concert to produce them. He then offered to reveal his sustainable product sources to help other manufacturers with production of their green products. 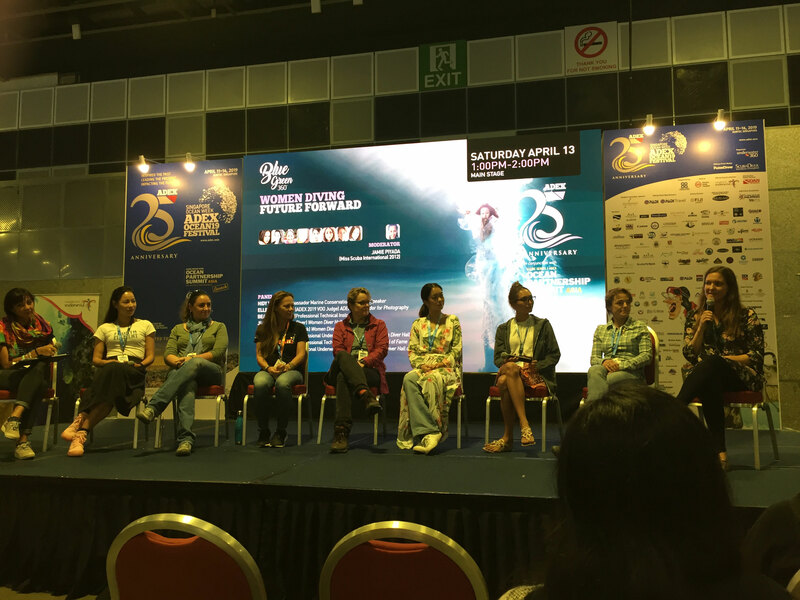 Adjourning for lunch, dive fans were treated to yet another compelling Fast Forward Panel discussion at 1pm at the main stage as a who’s who of women divers assembled onstage for the Women Diving Future Forward Panel discussion. Moderated by Jamie Piyada from Manta Trust, the panelists included Ms Hidy Yu, ADEX Marine Conservation Ambassador, Ms Beatrice Rivoira, Marine Biologist and technical diver, Ms Ellen Cuylaerts, ADEX Ambassador for Photography, Ms Jill Heinerth, Member of the Woman Diver Hall of Fame, Patty Lee, host of popular Taiwan dive travel show, Salty Mask, Ms Jade Hoksbergenn, Professional Underwater Photographer, Ms Nathalie Lasselin, Film Director and Professional Technical Diver and Ms Amanda Cotton, ADEX Singapore 2019 VOO Judge completed the list off women luminaries in the discussion. As strong women in diving, it was uplifting to see that they had all challenged the status quo and emerged as leaders in their field despite their common experience of encountering sexism in their early years. A common refrain from the panelist was how they noticed that sexism was not overt today as compared to the past when DEMA shows would feature bikini women hired to appear in the show even though they were not divers. Most of them acknowledged that unintentional sexism due to old mental habits might still be a common occurrence but as leaders in diving, they were seeking to not be defined by their gender anymore but to be recognised as just great divers, biologists, artists and photographers. One of the most beautiful and dangerous activities in diving is ice diving. 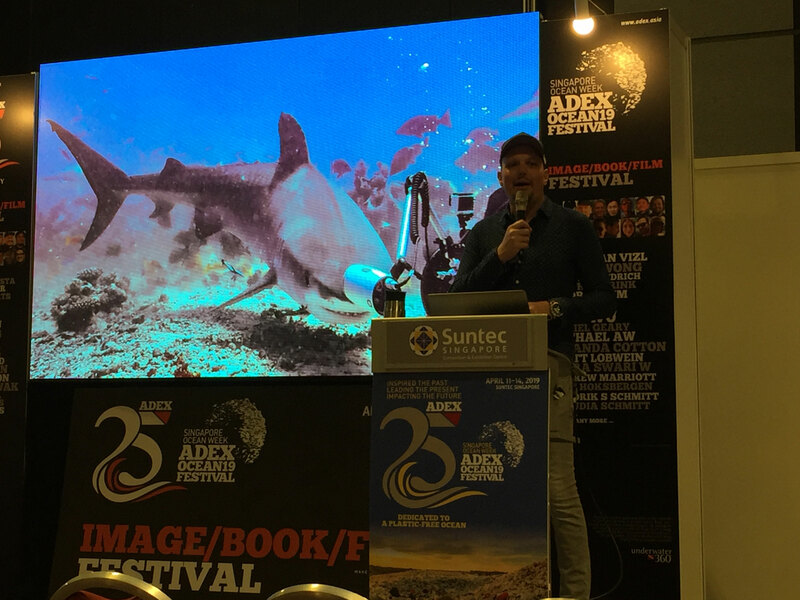 Underwater photography fans were given a rare treat at 2pm at the Photo-Video Zone in ADEX Singapore as Gerald Nowak shared with audiences his incredible photographs taken during his ice diving trip to Antartica in 2008. A long-held cherished dream, Gerald managed to capture never before seen photographs of a sea leopard underwater underneath the ice. A whopping four metres long, Gerald described the playfulness of the sea leopard and only realised the enormous size of his subject when he surfaced after hearing shouts from his friends to come out of the ice. 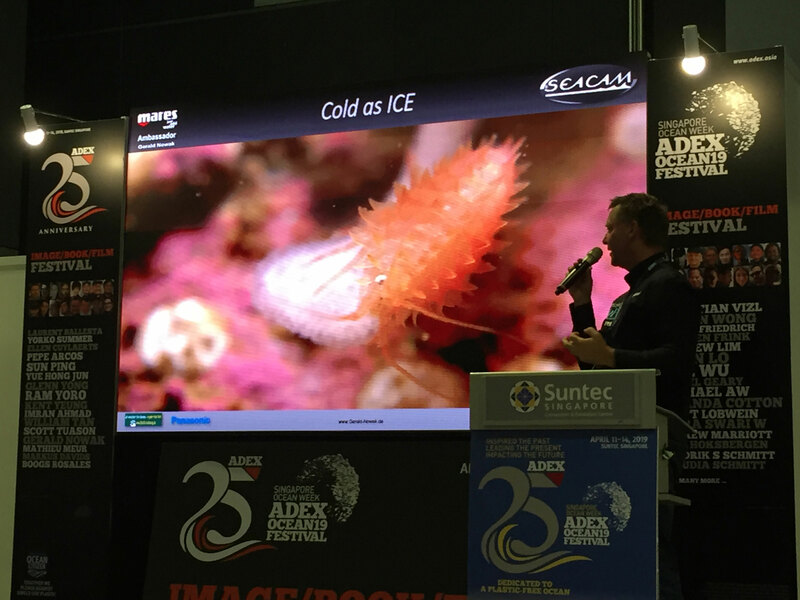 Gerald Nowak showing audiences his beautiful photos of marine creatures underneath the ice. 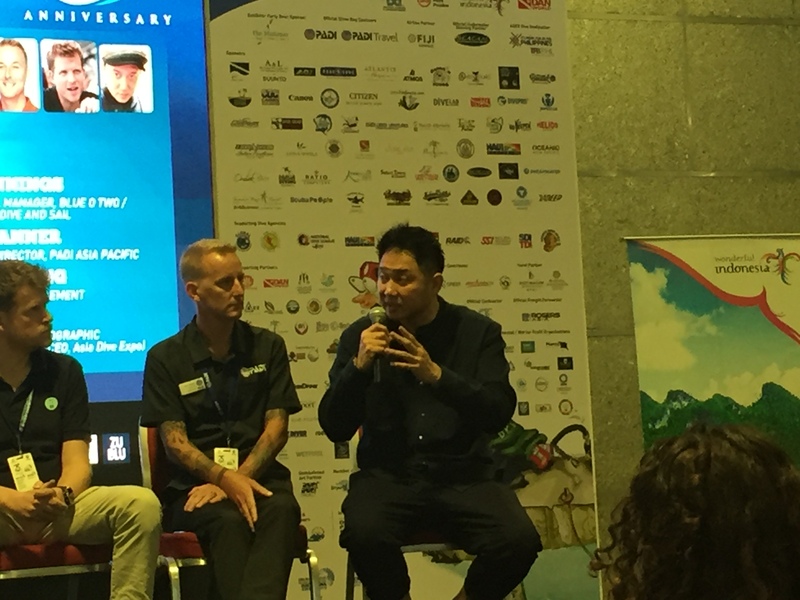 The highlight of the day was undoubtedly the Tham Luang Cave Rescue Panel discussion headed by Asian Geographic CEO, John Thet and DAN (Divers Alert Network) President and CEO, William Ziefle. The discussion saw a reassembly of some of the heroes of the Tham Luang Cave Rescue team such as Ben Reymenants from Blue Label Diving, Mikko Paarsi of Koh Tao Tec Divers, Claus Ramsmussen of Blue Label Diving, Douglas Yeo of Sunfish Dive, Professional Tech Diver, Tan Xiaolong, famous Thai singer and actor Ms Narinthorn Na Bangchang of Eightyy Eight Eight and her assistant, TV Producer, Ms Chang Pichamon Changkwangyuen of Eighty Eight Eight. Ben, Claus, Mikko, Xiaolong all shared their experiences and feelings about the rescue and it was evident that all of them now enjoyed a shared bond from experiencing such a harrowing but life affirming experience. Their bravery and selflessness was evident from their demeanour onstage as it was with Ms Narinthorn and Ms Chang Pichamon, both of whom provided invaluable help to the trapped school boys as well.